Breathwork is a complete self-healing system using conscious breathing to facilitate improved well-being, inner peace, greater joy in life, mind expanding and breakthroughs. It works by facilitating the natural healing process for all types of trauma, being beneficial in gaining greater physical, mental and spiritual health, and in maintenance of optimal health. The meaning of Tsa Lung is tsa, which are the subtle channels of the physical body, and lung, meaning wind. Inside each of these physical channels wind must flow. Lu Jong exercises help to open many chakras and subtle channels, but it does not go deep enough. Tsa Lung works with both the body and the breath. It is a technique that combines movements with holding the breath. Because you are holding the breath, the movements can penetrate deeper into the body and open more of the smaller channels, the very subtle chakras. It is only possible to open these small chakras with the breath. Movement alone is not sufficient. Something more subtle, such as the breath, must be used to reach these subtle places. For the purpose of Tsa Lung practice we believe there are two types of wind: the wisdom wind and the karmic wind. The karmic wind is what blocks the chakras. When the wind is flowing in the channels we call it the wisdom wind. Actually it is the same wind, but if it is blocked we say it is the karmic wind and if it flows we say it is the wisdom wind. When you hold the wind and use special techniques to move it to various chakras in the body, you are able to open all of your subtle chakras. This means that all of your karmic winds are transformed into wisdom winds. We also have both coarse and subtle breath. All speech is coarse breath and the breath itself is the subtle breath. When you would like to go even deeper than Tsa Lung, then you need to practice Tummo. Self Transformation breathwork technique uses specific breathing exercises where the breathing is done in conscious and systematic way to release pain, fear, anxiety, depression and subconscious blockages. Mihaela was trained by Vic Hao Chin, the founder of Self Transformation in Philippines nine years ago, and she is now a TS facilitator. For example another technique she uses, similar to Self Transformation, is called Holotropic Breathwork. It is also an approach for self-exploration and healing. It integrates insights from modern consciousness research, anthropology, various depth psychologies, trans personal psychology, Eastern spiritual practices, and mystical traditions of the world. The name Holotropic means “moving toward wholeness”. Rebirthing-Breathwork, or Intuitive Energy Breathing orConscious Energy Breathing, is the ability to breathe Energy as well as air. It is the art of learning to breathe from the Breath Itself. Rebirthing is a valuable self-healing ability that anyone can learn. We can not have disease and relaxation in the same space at the same time. Relaxation is the ultimate healer. Every breath induces relaxation. Therefore, breathing is the basic healer. Conscious Energy Breathing is the most natural healing ability of all.This ability involves merging the inhale with the exhale in a gentle relaxed rhythm in an intuitive way that floods the body with Divine Energy. Rebirthing also means to unravel the birth-death cycle and to incorporate the body and mind into the conscious Life of the Eternal Spirit – to become a conscious expression of the Eternal Spirit. This involves healing the eight kinds of human trauma, which are the birth trauma, the parental disapprovalsyndrome, specific negatives, the unconscious death urge, karma from past lives, the religion trauma, the school trauma, and the self imposed trauma. This kind of Breathwork is a very important spiritualwork involving a series of Intuitive Conscious Energy Breathing cycles that also promote vibrant health, joy, and a deep peace of mind. The sense of Divine Energy moving in and out of our own body and mind is very magical, mystical, and miraculous. 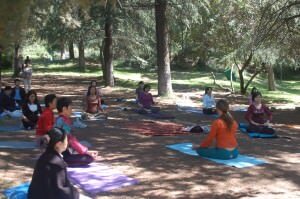 The breath work that Mihaela teaches during retreats, classes and private sessions, is a combination of different techniques, depending on the need of the individual.